I do not remember reading this particular book review before, which is an unusual thing for me to admit. The Rockite movement is also a bit of history that I had missed out on until now. This abridged edition of the memoirs of an early Victorian evangelist and novelist gives us an example of something that is not rare in history: a situation in which one group's millennialism is soon reflected in comparable expectations in a hostile group. In the early 1820s, Charlotte Elizabeth Tonna (1790-1846) encountered a form of millenarianism in the sporadically violent “Rockite” movement of rural and Catholic southwestern Ireland. That encounter may help explain her own turn to apocalyptic millenarianism, though we should note that a similar doctrinal development was then taking place among influential Protestant Evangelicals on both sides of the Atlantic. In any case, that revival of millenarian eschatology remains influential to this day. 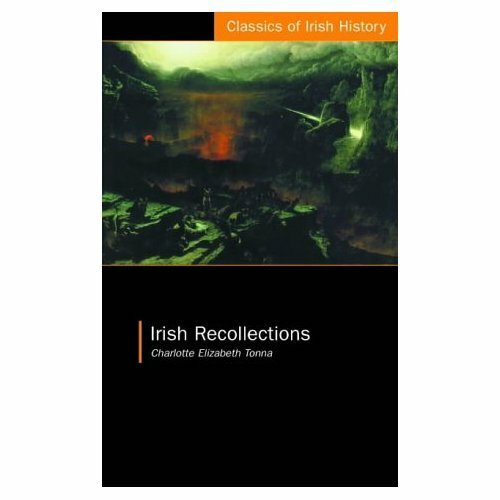 “Irish Recollections” is useful social history for non-apocalyptic reasons, too. Charlotte Tonna (nee Brown) was an Englishwoman who lived in Ireland only from 1818 to 1824, while married to an abusive Army-officer husband. His sole merit seems to have been that he spent much of the time posted to North America. The author describes her domestic life only elliptically, but we do learn that she had to flee to England to protect her earnings from her nascent writing career from him. Charlotte Tonna also suffered from a physical disability. As a small child, she went temporarily blind. Medicated with mercury, she became permanently deaf. From this text, it is hard to tell how deaf: she portrays herself as functioning normally in society, and even teaching Bible school to hearing children. In any case, she became very interested in the instruction of the deaf. The person she mentions most often is a deaf-mute Irish boy named Jack, whom she more or less adopts from his parents, and who accompanies her to England. He dies at age 19, but his life provides much of the narrative's structure. The author invests his syntaxless hand-signing as preternatural expressions of a saved soul's spontaneous antipathy to the Church of Rome. This looks very much like someone is pulling someone else's leg. Maybe the author is pulling ours, but more likely her informant was pulling hers. Actually, the wonder is that Charlotte Tonna maintained her obvious affection for the Irish through a period when part of the Catholic Irish population really was a menace to human life, particularly to people like her. Her stay in Ireland coincided with an eruption of rural violence, which is referred to as the “Rockite Movement.” The name refers to a metaphorical “Captain Rock.” Like the nearly contemporary “Captain Ludd” and “Captain Swing” in England, the name “Captain Rock” lent itself to intimidating graffiti. In Ireland during the Rockite period, rent collectors were killed or threatened. Armed bands fought pitched battles with police. The houses of landlords were attacked. The vastly outnumbered Protestant gentry were systematically terrorized. Sometimes they were frightened off the land. The clergy of the Church of Ireland, the established Protestant church that was part of the Anglican communion, were supposed to be supported by tithes paid by the Catholic majority. They were given to understand that no more tithes would be forthcoming. The author's description of this campaign of intimidation sometimes sounds very much like some accounts of slave uprisings in Jamaica; or for that matter, like the Spartacus revolt of the first century BC. The author is at pains to point out that the insurgents did not act indiscriminately, and were often scrupulously polite to people whose houses they searched for weapons. The author goes beyond the claim that the insurgents were rational, however. She insists that they were the unknowing pawns of a centralized conspiracy, one no doubt under the ultimate control of the office of the Propaganda in Rome. The degree of centralization of the Rockite Movement continues to be in dispute, as does the content of its ideology. Rockism sought the redress of grievances about rents and tithes, matters that could be adjusted without the total overthrow of the social order, much less the end of the age. However, the movement clearly had a strong millenarian component. Some elements of that component were traditional. One major source was a fund of prophecies attributed to the saints, particularly to St. Columbkille. The prophecies often involved a military campaign in which the Irish would lose two battles but win the third. There was also a note of messianic expectation. Daniel O'Connell, perhaps, benefited in later years from that, as specifically millenarian hope faded and secular political enthusiasm took its place. The best-known source of Rockite eschatology was a member of the Royal Academy, Charles Walmesley (1722-1797). Walmesley was a respected astronomer and onetime Catholic Bishop of York, but he seems to have maintained the Newtonian tradition of eschatological speculation. Writing under the pseudonym “Signor Pastorini,” around 1790 he published an often-reprinted “General History of the Christian Church,” based on the Book of Revelation. Among other points, he suggests that the locusts of Revelation, Chapter 9, represent the Protestant sects, and that the period during which they would torment the world would last just 300 years. Sources vary about which date for the end of Protestantism the Pastorini system actually implies. One literal reading would have arrived at 1821, but popular opinion in Ireland focused on 1825. Aside from the rural violence, another effect of the anticipation of that year was an upsurge of attempts by Catholics to convert their Protestant neighbors. The author notes a new willingness on the part of the ordinary Irish to engage in religious disputation, which she says actually redounded to the Protestant cause. In any case, this apocalyptic proselytism somewhat resembles those instances in the Middle Ages when a wave of millenarian enthusiasm would move the Christians of a locality to try to convert the Jews in the neighborhood. When that failed, the Christians had a tendency to try to kill them. Nothing like that happened in Ireland; though as we have noted, enthusiasm that commenced in mysticism ended in politics. Catholic Emancipation occurred in 1829. In this story, that reform appears as a looming catastrophe whose dire consequences manifested themselves in the following decade. Ireland in the first 30 years of the 19th century was scarcely the Ireland of the Penal Laws. There were substantial Catholic landowners and thriving Catholic institutions. Still, Irish Catholics did suffer from some civil disabilities, notably the lack of the parliamentary franchise. Correcting these anomalies had been on most reformers' “to do” list for two generations, not least because of the expectation that final emancipation would dampen Irish political unrest. However, though Charlotte Tonna and her Evangelical friends were themselves Victorian reformers for most purposes, on this issue they sided with the darkest reactionaries. The author explains that it makes no sense to give Catholics the vote, since Catholics are wholly under the control of the hierarchy; emancipation would be like putting Catholic bishops in the House of Commons. She was also aware that the Church of Ireland would not long remain established if the Irish had more control over their own affairs. To these strangely concurrent circumstances was added one yet more striking; namely, the fact that the noted Pastorini had predicted many years before, that the great effectual blow against Protestantism would be struck on the 14th of April: -- the 13th of April, 1829, was the day on which the royal assent crowned the notorious bill. After [giving a parcel of anti-Catholic tracts to a departing Catholic chaplain], which indeed proved a great relief to my oppressed feelings, I took my little nephew and sallied forth for a walk. It was a glorious day; the sun shone with surpassing brilliancy from a cloudless sky; and the fresh breeze had all the softness of advanced spring. I strolled through a grove of oaks, pondering on the naval greatness of my country, on the vaunted “Hearts of oak” that both formed her fleets and manned them, and bewailing the infatuation that had now planted a deadly Upas [a poisonous tree] in the midst of her fair national garden. Every object around me seemed to speak reproach, from the peaceful beauty of that fearless repose in which for so many centuries our happy isle had lain beneath the shadow of the Lord's hand. “I have nourished and brought up children, and they have rebelled against me,” was the purport of the voice that seemed to breathe rebuke. The endtime is a time of hope. The author associated the Battle of Navarino with the opening of the 6th Seal in the Book of Revelation. In that naval engagement in 1827, combined action by the British, French, and Russians broke the power of the Ottoman Empire over Greece. The author looked for the eventual collapse of Turkish power over the eastern Mediterranean, leaving the way open for the return of the Jews to Palestine, and to their eventual conversion.